Am I not geeky enough? The European Teams Championship finished earlier today with an interesting, and surprising winner. Having followed the tournament through both the traditional chess media, and Google News, I picked up a number of interesting side stories. For example, the coverage of the Round 7 match between Armenia and Azerbaijan seemed to carry a little extra venom, due to the recent enmity between the two countries. With the match ending in a 2.5-1.5 win for Armenia, the Aysor (Armenia) news outlet couldn't resist a dig at the losing team with a headline that read "Azerbaijani chess players slaped(sic) in the face of their own media"
I don't know how much that article stung the Azerbaijani players but of course they had the last laugh, finishing as the winners of the ETC. Going into the final round tied with Russia, the picked up the 2 points with a win over The Netherlands (2.5-1.5), while Russia was held to a 2-2 draw by Spain. Russia went one better in the Womens championship, finishing first on tie break, over Georgia. Click for the results of the Championship and the Womens Championship. To (some) non chessplayers, chess is simply a war game, without any shooting. You don't "take", you "kill", you pieces don't move, they "march". On the other hand, for most chessplayers, such direct terms can sound strange. But I still see military terms used, although mainly in books from a previous age. Nimzowich in "My System" talks of getting your army to the frontier (ie the line across the middle of the board). And Isaac Lipnitsky's much acclaimed "Questions of Modern Chess Theory" there is a chapter titled "Mobilizing the Pieces". In Lipnitsky's case he may have chosen this term over the more pacific "Developing the Pieces" due to his military background (he was a Major in the Soviet Army during WWII). "Chess as a sport", not "Chess is a sport", which is another topic entirely. The Asian Indoor Games is starting tomorrow in Vietnam, and Chess is one of the medal sports, alongside Track-and-Field, Fin swimming and Snooker (plus many others). More importantly, Chess is also a medal sport in the South-East Asian Games, which is a full sporting contest for South-East Asian Countries. Why is this important? Simply because it avoids the semantic arguments about whether chess is a sport. One of the important aspects of the recent tournament in the Solomon Islands were discussions with the Solomon Islands government about support for chess through their sports commission. To this end, both myself and Oceania Zone President Gary Bekker stressed the importance of getting chess into the Pacific Games. This suggestion was met favourably by the SI Government btw. Now to be honest, I can't see chess being a medal sports at the Olympics (unless they take up my suggestion of holding an Indoor Olympics + plus an Extreme Sports Olympics to fill the gaps between the winter and summer games), but getting it into regional games (Asia, the Pacific and Africa) can't hurt the development of chess in those regions. I'm not a great swindler. Once my position starts to sink, I'm usually the one drilling extra holes in the bottom of the boat. And when I do claw my way back from a lost position it is normally due to my opponents poor play, rather than my skill. But there are exceptions, as this evenings game from the chess club shows. We join the action after I dropped a couple of pawns by simply failing to count the captures, although I do have tricks. My best hope was to clear a path for the pawn on c6 to promote, although with the bishop planted on d8, at best I was winning a piece. Of course to achieve even this I had to jettison all my pawns. 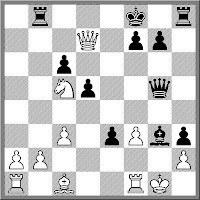 Now before you ask, the perpetual has indeed disappeared, as the Black king can head to h8 (and not get mated). 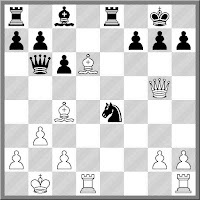 But with Black king confined to the back rank, my rook and knight can pick up enough black pawns to secure the draw. Every day or two I do a quick patrol of the sites on my blog roll (look to your left). While visiting the Chessdom site, I noticed they had added a new live coverage tool, which was developed by, and named after, Chessbomb. I've had a play with it and it looks really good. The site combines broadcast, computer analysis (from Rybka) and user comments into one interface. For the moment they are only covering the European Teams Championship, and the time difference works against us here in Australia, but it is still worth visiting during the day, as the overnight broadcasts are archived. For example, two games worth looking at from Round 5 are the Sutovsky v Svidler game, and the Bacrot v Aronian matchup. Due to the magic of colour coded moves (and Rybka) you can see where the players went wrong at crucial junctures during the game. The "Obama wins world chess championship" satirical article has popped up on a number of blogs, although to me it lacks two important ingredients of good satire, in that is is neither clever nor funny. But it did provoke an unintentionally hilarious response from Stan Vaughn, who I previously chronicled here. I present the entire letter Stan wrote to the Tampa Tribune, completely unedited. Nonetheless it would be delinquent of me not to point out that the claims made in this letter are demonstrably false. Please be advised that the World Chess Federation, Inc considers your story in October 24th Tampa Tribune that it has declared Obama as WCF World Chess Champion to be inaccurate. Further, FIDE is the International Chess Federation and does not have any rights to the World Chess Federation tradenames and trademarks as World Chess Federation, Inc, a Nevada corporation, holds worldwide rights to the tradenames and trademarks for World Chess Federation. 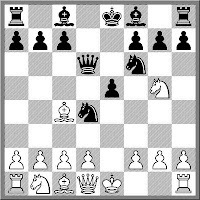 Further Fischer did not sign the 2002 Prague Agreement and further Anand turned down the opportunity in 2000 to play for the WCF World Chess Champion title so therefore any claim is not undisputed as further in 1992 FIDE Campomanes signed over legal rights to title of The World Chess Champion to Bobby Fischer. now deceased. Further should Obama wish to play in the upcoming WCF The World Chess Championship Qualifying Tournament in Las Vegas Dec 2-13 at Riviera he may only do so not representing USA as Kenya recently provided a certified copy of his Kenya Birth certificate and after his later Indonesian citizenship he never became a naturalized US citizen. You may have also heard that the US military is now revoking orders to go to Afghanistan for all military personnel who are filing court challenges to deployment orders in light that Obama is not eligible to be President nor commander in chief . Attached is a certified copy of his Kenyan birth certificate as provided by Kenya and further the so called certificate of live birth Obama provided allegedly from Hawaii has been certified a fake now as had photoshopped borders of different year than copy and experts proved had black and white pixels not green behind wording that had replaced earlier different text. Now Mr Vaughn is also the organiser of the 'World Championship' match in Las Vegas later this year. Not that I was planning to attend mind you, but if I want to be exposed to this kind of craziness, I can save the air fare by instead watching the nutbags on Fox News from the comfort of my living room. Even though Street Chess is a serious tournament (with prizes and rating points at stake), I still like play in the 'coffee house' style, especially just after I've lost a game. For those unfamiliar with the term 'coffee house', it is a style of chess based on speculative attacks, sacrificing material, and trying to win by bluffing your opponent that your attack is much stronger than it really is. Yesterday I played a good example of all of the above, with the added bonus that the banter between myself and my opponent attracted the interest of a large number of spectators. I was black and my opponent opened with an interesting variant of the Colle, in which he develops his knight to g3, in part to support the thematic e4 break. I decided to go after this knight with my h pawn. By move 10 he had committed the cardinal error of moving some pieces twice in the opening, while others he hadn't moved at all. With my lead in development it was a question of where I was going to crash through, which he then answered for me by castling. I picked up a couple of central pawns while he decided to commit further sins by sending off his queen on a pawn hunting mission. I offered a piece soon after, which he declined, so I sacrificed it 2 moves later. In true coffee house style my 19th move (Qg5) looked quite strong, but actually wasn't. He firstly played a diversionary capture with 20.Nxc5 and after I replied 20. ... Bxg3 he thought for a while and then loudly exclaimed "But it's check!" 21.Qxd7+ Kf8 was quickly played, and then with a flourish he blocked any discovered attacks with 22.Qg4 This turned out to be a losing move as I now recycled my queen, not once but twice, all in the space of 5 moves. When the smoke had cleared I had a forced mate, and he was congratulating me on my 'lucky' win! The 2009 World Junior Championship has already started in Argentina. Australia has 3 representatives playing, Sherab Guo-Yuthok in the Open, Emma Guo and Sarah Anton in the Girls. 3 rounds have been played, with Emma on 1.5/3 and Sarah on 0.5/3. In the Open, Sherab has yet to get of the mark, but I'm assuming some easier opponents will soon be coming his way. The official website is having problems, so the best place to get results is the ever reliable www.chess-results.com. The link for the Open is here, and the Girls is here. Over at the ClosetGrandmaster's blog, TCG is still trying to breathe some life into the whole "Beauty and the Geek" debate. He originally posited that the appearance of Canberra chess player Jeremy Reading was damaging to chess, but the debate, and the public vote, didn't quite go his way. He's having one more go at the topic, although I note with interest that Jeremy has been transformed in Mr Reading in the last post. Now whether the 'geek' image is damaging to chess, or even whether someone is a 'geek' at all, probably depends on who is being asked. But here is a little test. Which one of these photos is of one of the top players in the world, and which is of a 'geeky' Australian television personality? You know you have too many chess friends on facebook when their status updates begin to look like a tournament crosstable. A case in point is a number of posts flagging the 2009 European Teams Championship which starts today. The event has 38 teams representing 37 countries (host country Serbia gets 2 teams) and unlike the Olympiad, there is very little "filler". Even the bottom seeded team, Monaco, has GM Igor Efimov on board 1. Interestingly they also have former FIDE Treasurer, Willy Iclicki as their board 4. Most of the top teams have brought very strong players (Svidler, Topalov, Aronian etc) although Norway lost Carlsen at short notice. The website for the tournament is http://www.eurons2009.com/eng.htm and hopefully there will be live broadcasts of the games (implied from the website although I haven't found the link yet). Years ago there was a tournament that offered a special prize for the "Most Efficient Use of Energy" (IIRC). This was calculated as the total number of moves played by a player in the tournament divided by the number of wins. The smaller the number the better. I believe the event was sponsored by a power company. In the same vein is what I would call the OMG ratio. This is the number you get when you divide a players rating by the number of moves played in a game. In this case the bigger the number the bigger the OMG factor if said player loses the game. Excluding results due to mobile phone defaults, or simply not showing up (although in the case of Fischer this is still pretty big on the OMG scale), once you reach a ratio of 200+ you know something pretty spectacular has happened. 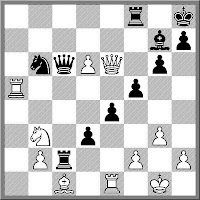 Here is an example from the 2001 FIDE World Championship KO. 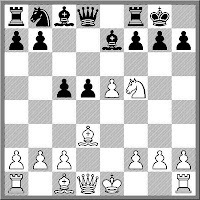 Motylev and Shirov play a messy QGA, when on move 12 Motylev finds a spectacular losing move. Australian CC Grandmaster Romanas Arlauskas has passed away at the age of 92. Arlauskas was awarded the CC GM title after finishing 3rd in the 4th CC World Championship (1962-65). Originally from Lithuania, Arlauskas emigrated to Australia in 1948 and settled in Adelaide, winning the 1949 and 1968 South Australian (OTB) Championship. Further information can be found in Peter Parr's Sydney Morning Herald chess column. Susan Polgar's blog has a report of a blitz tournament that was played in Carlsbad Caverns in the United States. From the photos it looks as the games were played deep underground, and lamps had to be used to illuminate the boards. When I was younger I did a little bit of spelunking, although chess was one thing I didn't do underground. I've crawled, swam and got lost in caves, and have even done some abseiling. Maybe next years trip to Blayney will involve a detour to Abercrombie Caves, with a few games of blitz to mark the occasion. 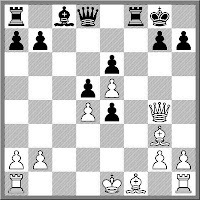 There comes a time in every junior players career when they discover the venerable Blackburne Shilling Gambit. If all goes according to plan then 1.e4 e5 2.Nf3 Nc6 3.Bc4 Nd4?! 4.Nxe5? Qg5 5.Nxf7 Qxg2 6.Rf1 Qxe4+ 7.Be2 Nf3# leads to the kind of quick win that juniors love. This discovery is then followed by attempts to play it at every opportunity, until their regular 'customers' get wise to the trap. 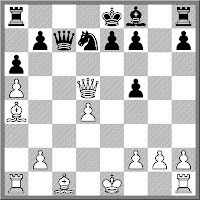 However, if you wish to demonstrate this trap in a way that doesn't seem to break so many opening principles, then this game, which I found in a 1998 issue of Chess in Russia, may do. And a short, shameful confession. I won a game in my first serious tournament with the short version of this trap. I don't know whether 2600+ players decide that trying to grind down another 2600+ player is unproductive, but I am always impressed when both players try and mix it up. 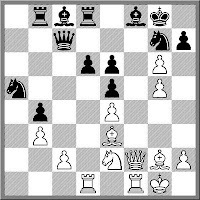 In the following game Sokolov tries a sharp sideline on move, which unfortunately blows up in his face. And bonus points for the game ending with a castling move! According to the Sofia Sports Agency website, the 2010 Anand v Topalov World Championship Match will be held in Sofia Bulgaria in March 2010. The link to the story is here, and I assume the decision was taken at the FIDE Congress in Haldiki, Greece. For the moment the FIDE website has nothing on this story, but this may be due to the slowness in getting any news from the congress on to the website. The 2009 Victorian Championship has just started, and as usual is a strong tournament. The field includes GM Darryl Johasen and IM's Sandler, Morris and Rujevic. The event is being played at a rate of 1 round a week, and unlike previous years, seems to be keeping a strict 'all games at the same time' format. Already there has been one interesting incident in the supporting Reserves tournament, which I have covered here, on my Chess Rules blog. Results and pairings for the tournament can be found at the ChessVictoria website. The 2009 FIDE Congress is happening as I post this. I had hoped to attend this year, but a shift in venue from Singapore to Haldiki in Greece made it difficult both in terms of time and money. In non-Olympiad years the majority of the congress is taken up by technical meetings, as there is no General Assembly. My main reason for wanting to attend was to take part in the meeting of the Technical Administration Panel (TAP), which is responsible for Olympiad issues. I've received a brief report on the meeting from Nick Faulks who described it a 'purely technical' and confined to pairing rules for the 2010 Olympiad. The major decision to come out of the meeting is that Accelerated Pairings will not be used. I'm sure this will please most teams. Canberra juniors are still performing well on the national stage, winning 2 out of 3 tournaments at the Australian Young Masters. In the top event, Andrew Brown (ACT) was a convincing winner on 7.5/9, a point and a half ahead of second place Blair Mandla (NSW). Current ACT Junior Champion Allen Setiabudi finished on 4.5, while WFM Emma Guo scored 3.5. The Girls Masters was a 6 player double RR and was won by Alana Chibnall (ACT) on 7.5/10 while Megan Setiabudi (ACT) tied with Leteisha Simmonds Sophie Eustace on 6.5. Jo Mason (ACT) scored 1.5. There was also a Junior Masters event, which was won by Sally Yu (Vic), although there were no ACT players in the field. Before there were blogs and websites dedicated to up to the minute chess news, the best source for topical information on the current happenings in the world of chess was The Week in Chess. TWIC (as it is more commonly known) was, and still is, produced by Mark Crowther and is a weekly newsletter of current tournament from around the world. I used to rely on it heavily for news back when Paul Dunn and myself were doing The Chess Show on 2SSS-FM in Canberra. Of course when someone becomes famous for one thing (as Mark is), it is often forgotten that they can do other things. In this case the other thing is playing chess! Mark has a current ECF Grade of 188, which is about 2100 FIDE. 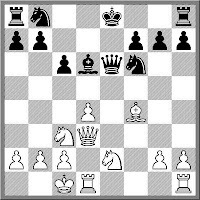 And while talking to him about other matters, he sent me a game from a weekend match played between his club, and the Alwoodley Chess Club, which is the home club of my PNG team mate, Rupert Jones. It turned out this was the decisive game of the match, and in part demonstrates the difference between individual chess and teams chess. As every game may be crucial to the final score, you need to hang in there for as long as you can. Thinking you have a winning game, and finding out you don't can be a painful experience. In the diagrammed position White looks like he has it in the bag. He however chose to take the pawn on c7 and after Qa5, it all came unstuck pretty quickly. Something has been bugging me for a while. When I do a search on "chess" on google news, I get a number of mentions of the current Division Series playoffs in American Major League Baseball. I recall seeing the same thing last year as well, and so my question is: Does the term "Chess Match" refer to something specific in baseball (ie the current playoff series, long standing rivalries) or is it just a popular term amongst sports writers to add gravitas to the game? As my birthday (today) falls on a Friday this year, it coincided with me playing members of the public on the giant chess board in Garema Place, in the Canberra city centre. I had blogged about this before (the giant board that is, not my birthday), and I have a few new observations to add. Firstly, there is plenty of hidden talent wandering the shopping malls of Canberra. Although I won the 4 games I played, all my opponents (including a 5 year old child) had some idea of what to do. This actually makes for some good chess, as the game usually requires some 'cleverness' to win. Secondly, once each game started quite a large crowd gathered. I could see various spectators passing on their chess wisdom to their friends and there was a lot of nodding and pointing before and after each move. However,once the game finished the crowd seemed to completely vanish, to be replaced by a different group of people 4 or 5 moves into the next game. Here is one of the games I played, against an opponent who was probably a little single minded in his attempts to checkmate me. Towards the end of the game he even got as far as to threaten mate in 1, but unfortunately for him it was my move, and got my checkmating attack in first. Chess coaching is often full of contradictions. 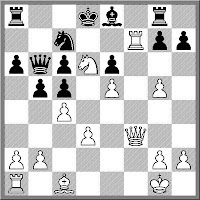 While it is important for beginners to learn the virtues of solid, mistake free chess, this isn't the stuff that makes chess exciting. So after 35 minutes of 'put your pieces on safe squares, keep material even or in your favour', you wheel out the Morphy 'Opera Box' game to show them something interesting, and all they take away from the lesson is that you should sacrifice all your pieces to win. Another good piece of advice is "develop your pieces before you attack". But if you are going to teach that lesson, then make sure you don't show the following game at any stage. 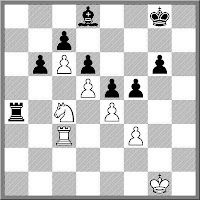 It was played in the 1916 match between Janowski and Marshall (two obsessively attacking players for sure), but after 12 moves Black has only one developed piece, and he sacrifices that on move 13. Then with no pieces off the back rank, he proceeds to launch the mating attack. Not a great advertisement for the aforementioned advice. Nonetheless it does serve as an example that chess is not just about one thing or another. 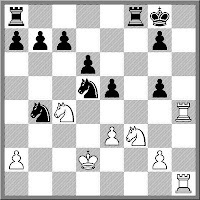 In this case the other factors in play were White's lack of King safety (12.Qg4 was the culprit here) and Black's use of the open f and c files. One surprise entrant in the current ANU Chess Club event was Jeremy Reading, but only because he had been locked away for the past month as part of a gaggle of geeks on the reality TV program "Beauty and the Geek". As the show has yet to go to air (it begins on Channel 7 tomorrow night) I expected him to be held prisoner by the producers until the final episode made it to air. However it seems that the various non-disclosure agreements he presumably had to sign are protection enough, as he declined to tell anyone (including his own brother) how it all turned out. But I will hazard a guess and say that he didn't spend much of the time away working on his chess, as he was held to a draw by an opponent rated 400 odd points below him. Via Chesstoday comes the following position from the current European Club Championships. 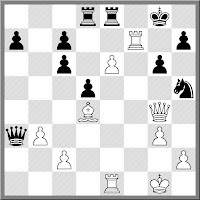 The game is Stamenkov v Kamsky and it is Black to play and win. Nothing special about the winning move, but I am impressed by the length of Black's pawn chain. FIDE are moving towards settling a venue and date for the Anand v Topalov World Championship Match. At what speed they are moving seems to depend on the bidding consortium's themselves. Although three bids have been recieved, none contain the financial guarantees that were required by FIDE. The three bidding countries, Bulgaria, Turkey and Singapore, have been given an extra 2 weeks to provide such guarantees. I'm surprised that the Bulgarian and Turkish bids didn't provide such a guarantee, given the close relationship between those countries chess federations and the government. I suspect Singapore on the other hand was always going to be a much more private business venture, and therefore much more likely to be affected by the GFC. Early days yet, and while I have a personal preference for Singapore (easier to travel too), I suspect that Turkey will win out, by virtue of being a neutral country. The European Club Championship has just started, and it is often a chance for regular club players to mix with the super GM's in the same event. Of course this 'mixing' may involve a severe beating at the hands of a 2700+ GM, but I'm sure that the following game proves that it could happen to anyone. Gashimov demolishes Gelfand's Petroff in 16 moves, after the latter chose the wrong moment to castle. I'm guessing that it probably wasn't opening prep, as the game had deviated from book some moves earlier, but these days you never know. Earlier this week Allen Setiabudi became the 2009 ACT Junior Chess Champion, after defeating Alana Chibnall in a playoff. They had both scored 7.5/9, along with Justin Chow, although the ACT Junior Chess League rules only include the top 2 players on tie-break in the playoff match. What is interesting about Allen's title win, is that it comes after he tied for first in 2008 ACT Championship, meaning he was the 'all-ages' champion before he was a junior champion. Indeed, if Justin Chow had won this years junior, he would have achieved the same distinction as also finished first in last years ACT Championship. 52 players took part on this 3 day, 9 round event, and the full results can be seen here. I've been doing a lot of media recently (both on the KvK match and the Solomon Islands Tournament) and as a result I've had to answer a lot of chess questions from 'non-chess' reporters. One question most commonly asked is "Who is the best chess playing country in the world?" And the answer I give, "Armenia", seems to provoke the most surprise from the questioner. Even after I qualify the answer by explaining that they have won the last 2 Olympiads, there is still a level of disbelief. But at least one media organisation has decided to do its own homework, with the BBC sending a reporter to Armenia to investigate why that country is so strong. You can read the report here.